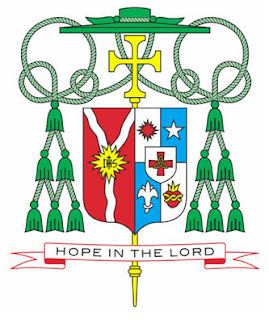 As previously mentioned, the Festival Express -- 17 days, five ordinations, two installations... and a Ted with a Golden Jubilee -- kicks off today in Shreveport, as the Louisiana church of 40,000 (one of Stateside church's ten smallest) sees the first episcopal ordination in its history. The rites installing Bishop-elect Michael Duca (above, hat in hand) as the diocese's second head will pack the city's convention center; some 2,500 attendees are expected, led by Duca's parents, three siblings, and 24 bishops. With the exception of some streamers hanging in the rafters (left behind from a recent art festival in the space), everything's said to be good to go, rented organ and all. Shreveport's new bishop is a proud Italian and Texan. He was influenced by St. Thomas Aquinas and believes in the power of hope. That's just what his coat of arms tells you about Duca. He also believes in being accessible, wants lay people to have a voice in the church and loves a good meal. 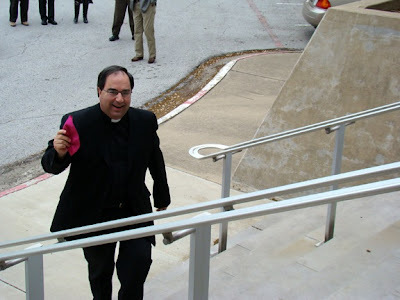 Duca was born and raised in Dallas and attended Catholic schools. His particular parish was known as a breeding ground for seminarians. He found role models in the priests and started meeting with a group of other teenagers trying to decide if the priesthood was the right path for them. "I liked the energy and excitement, and somehow I just wanted to help people," Duca said. After high school he went straight to Holy Trinity Seminary in Dallas. He kept learning about himself and the church and becoming more convinced of his vocation. He was ordained April 29, 1978, and went to work in a parish. "I always thought I would just be a parish priest," he said. "I'd be an assistant and then a pastor, and then I'd die." The church hierarchy saw something else for him. He was sent to work in campus ministry at Southern Methodist University, then to Rome to study church law, and then to Holy Trinity, where he has been seminary director for 12 years. "It all looked like it was all jumbled around and it didn't make sense," he said. "Maybe it makes more sense now. Every one of them has taught me something." His work at SMU taught him about working in a non-Catholic environment. And at the seminary, he learned patience as he watched young men mature and renewed his sense of enthusiasm. All of that led to a call in late March asking him to come to Shreveport. In the six weeks since his appointment was made public, he's tried to balance saying good-bye (he still has family in Dallas) and learning about his new home. Duca has been reading what he can to learn about the diocese, but he puts more weight on what the people and priests will tell him as he makes his rounds. "My first impressions are very optimistic. There's a lot of strength and lot of pride," he said. "You have to get out and meet people, hear their concerns." Those who have met Duca say he is intelligent, excited, humble and has a sense of humor. Monsignor Earl Provenza has been leading the diocese in between bishops, so he and Duca have been in regular communication. "I've been very impressed with Bishop-elect Duca, his kindness, humility," Provenza said. "He's a people's person." Dianne Rachal, director of worship for the diocese, has been overseeing all of the preparations for Monday's historic service. "Everything we hear is so overwhelmingly positive in many areas, pastoral service, interest in vocations, education, college campus ministry," she said. The No. 1 priority for local faithful seems to be recruiting new priests. Currently the diocese has 38 priests [22 active] and 41 churches and quasi-parishes. Three men are in seminary. Some churches have had to reduce the number of Masses offered as the priests have to be spread out more. Since he comes from a seminary, laity and priests are counting on Duca to use those skills to encourage more young men to enter the priesthood. "We also have to change our imagination about the priesthood," Duca said. "That we do by patiently, slowly being good examples, getting the word out and being men of love and service to the community." Provenza has great faith in Duca's ability in this and other areas. "I expect more converts, more vocations and a sense of unity," he said. ...from Big D -- where Duca spent a decade as rector of Holy Trinity Seminary prior to his late March appointment -- a flock of buses are making the three-hour trip. And in other Southern news, word from northern Mississippi reports local sightings of Purple Rain.